These scones are absolutely delicious, melt-in-your-mouth good!!! I have now tried them as a vegan-friendly version, after being inspired by a post on the popular mainstream cooking blog: Pinoy Cook that featured this recipe and some gorgeous photos too…. I have included options for making them sweet or savory, vegan or not. I hope you will enjoy them too. I look forward to hearing about your results. PS Please excuse the less than pristine albeit clean, oldie but goodie…. pizza pan in my ‘action shot’ it actually looks worse in the photo than it is !. Originally made with butter, these scones can also be made with a good-quality margarine (not whipped). Adding raisins makes them perfect for a tea time treat, omit for soup scones. Makes 8 large scones. ½ C. soy milk or regular milk (non-vegan)-approx. Heat oven to 375. Lightly grease and flour a baking sheet. Combine first 4 ingredients in a large mixing bowl. Cut in margerine or butter until crumbly. Optional- Dredge raisins with flour and add to mix. Add mashed potatoes and stir to combine. Add just enough of the milk to form a soft dough. Shape into a ball and allow to ‘rest’ for 10-15 minutes on a floured board, covered with a dampened dish towel. Knead dough for 2 minutes. 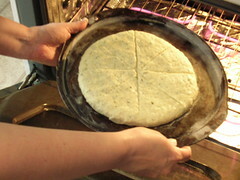 Place dough ball on prepared baking sheet and pat into a circle about 1″ thick. Score (cut, but not all the way through) circle of dough to form 8 triangles. Bake 20-25 minutes until golden brown. Reduce heat if browning too fast. Reprinted from: Not Just for Vegetarians, Delicious Homestyle Cooking, the Meatless Way. © Geraldine Hartman. All rights reserved. I haven’t done much cooking lately….only easy stuff I can do by heart because I’ve been so busy with other stuff. I’m supposed to through the worst of it in the next couple of weeks and I have a lot of catching up to do. These scones look great, the cabbage pasta thingy, + the rosemary rolls…..so much to cook, so little time. Hi Caroline, I hope you will try the recipes Ive featured from my cookbook, they are all easy to make. Joe tries recipes now from several cookbook but he says that many of them are just too complicated to follow and don’t turn out as planned (or taste lousy). He always ends up cooking more from mine, his choice. Flattering yes. I certainly like to try other people’s recipes, I have lots of cookbooks. Its actually kind of neat though, cooking from your own published cookbook. I am working on another one right now, more vegan, still home-style comfort recipes. I digress….The cabbage thingy (aka casserole) would be a great one to start with, VERY easy to make and tasty. Mmmm. I ready for a cup of tea with them.